Despite the goverment’s order for companies not to convert peatland into plantation areas, the company PT Riau Andalan Pulp and Paper (RAPP) has allegedly converted peatland in their concession area into an acacia plantation. Previously, President Joko “Jokowi” Widodo had ordered companies not to convert peatland pending mapping by the Peatland Restoration Agency (BRG) to see if particular areas were in protected or in production zones. However during his impromtu visit on Monday, BRG head Nazir Focad found that parts of RAPP’s consession area on Padang Island, Meranti Islands regency, Riau, had been converted into acacia plantations. “We have summoned the chief executives are Tony Wenas, president director of RAPP and president director of Royal Golden Eagle, the holding company that controls APRIL-RAPP. “We will discuss the issues with them (the executive),” Nazir added. During his visit on Monday, Nazir was accompanied by his deputy Haris Gunawan, two forest rangers from the Environment and Forestry Ministry and a number of locals to clarify a report about the company planting on the disputed area. When the entourage was investigating the area of peatland that bad just been planted with acacia seedlings, the company’s security guards stopped them and asked for their permit to enter the location. The guards insisted that the visitors needed to show a permit even though they had informed the guards who they were. “It was an impromtu visit so, of course, no appointment was made prior in order for us to see the field’s condition as it was. I just wanted to see the field and have a little dialogue,” Nazir said, adding that from his brief observation he could identify that violations had been committed. The company had allegedly cleared peatland areas on which healthy thick forest thrive. 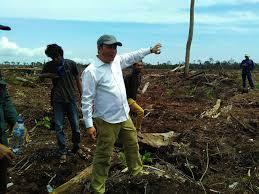 He said even though the company had in the past been given a license, it was only allowed ti manage damaged peatland. Peatland with healthy forests could not be touched. “A team will be sent to investigate and collect data in the field. If healthy peatland has been cleared then the company’s activities have to be restored with original vegetation,” Nazir said. Nazir said in October 2015 the President had given an order that, even with licenses, all peatland was prohibited from being cleared until the BRG finished mapping the location to see which areas were in protected or production zones. “The fact is the peatland forest I visited, which was still in a naturally healthy state, has been converted by RAPP. The President’s order seems to have been ignored,” he said. Separately, RAPP’s corporate affairs director Agung Laksamana said as a company operating in Indonesia, his firm would always follow existing regulations. “With regard to our operational permit, we abide by existing regulations. In running our activities, the company always coordinate with relevant stakeholders and always refers to Annual Work Plan passed by the government,” he said. Quoting testimonies from locals, Nazir said over 50 hectares of the disputed areas’ natural forest had been cleared and planted with acacia by the company in the last two months. The canal that had just been dredged in the middle of the acacia farm was over a kilometers in length. “The company has also cleared away people’s rubber and oil palm plantations half-a-km in length, also replacing them with acacia. This, I think, is what the company wanted to hide,” Nazir said. Nazir also said the company had met with the BRG to answer the agency’s summoning on Aug 2, to clarify the new canal’s construction and clearance of peatland, claming that their activities were legal and not in conflict with locals as the area was located in Mayang Sari subdistrict. “During the meeting we had yet seen the condition of the peatland. Now, after visiting the site, we now know whether they told a lie or not,” he said. He added that barricade tape had to be placed around the area becaus of signs of violation and to prevent further clearances of peatland occurring. He said it was feared major clearances of peatland and canalization would increase the risk of forest and land fires, as well as subsidence of Padang Island.